The most common viruses in your body are bacteria-infecting viruses called bacteriophages – and the most common bacteriophage of all might be the newly-discovered crAssphage. crAssphage! Researchers led by Radbound University Medical Centre's Bas Dutilh describe the highly abundant phage in the latest issue of Nature Communications. In their report, they estimate crAssphage to be roughly six times more common than all known bacterial viruses put together, making it far and away the most abundant of our body's most abundant viruses. 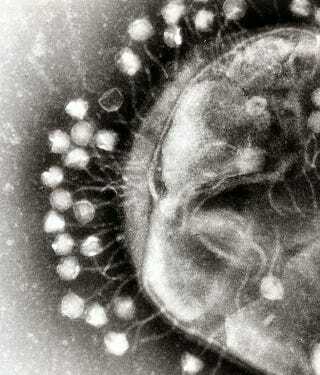 How could so common a virus go undiscovered for so long? ...how could such a common virus go undiscovered for so long, especially considering how popular the study of gut microbes has become? It's as if zookeepers suddenly realised that most of their zoos contain a giant grey animal with tusks and a trunk, which no one had noticed before. For one thing, the viruses in our guts are hard to study. "To study a virus, normally you have to make heaps of it, which isn't possible if you can't grow the host," says Martha Clokie from the University of Leicester. And since most gut bacteria won't grow easily in a lab, the viruses that infect them are similarly hard to rear. The alternative is to use metagenomics to analyse a microbe's genes without having to grow it. But first, you have to assemble your mish-mash of sequences, which come from different organisms, into a complete genome. It's a bit like putting all the pieces of a thousand jigsaw puzzles into one bag, and trying to solve just one. The usual strategy is to work off what you know by aligning these new sequences to those in databases. But this approach doesn't work very well for our inner viruses because most of them are unknown. The sequences in the databases represent the tip of the iceberg. According to Dutilh, around 75 percent of the DNA from any new stool sample—and as much as 99 percent—won't match any of these known sequences. So what's in that other 75 percent? Read the rest at over at NatGeo.